Sunny days and warm nights are just a couple of the more obvious reasons Barcelona is a perfect spot for a family summer adventure. The city has a sense of sophistication, yet makes it clear to both teenagers and parents that there is plenty of fun to be had by all. There are mouthwatering markets, colorful parks (with more than just room to roam), beaches galore and what seems like an endless supply of churros and chocolate. The city is fun to walk and wander. For longer stretches and for meeting the requirements of timed-entry tickets, Barcelona’s public transportation, the Metro, is inexpensive and easy to navigate, even with a family in tow. Here’s how to hit the teen-friendly highlights in just a few days. Mention the name Antoni Gaudi at the dinner table and chances are you won’t get much reaction from your teens. But when you climb the stairs from the Metro tunnel to street level and come face to face with his Sagrada Familia, that will change instantly. La Sagrada Familia is a work in progress and has been for a very long time. Gaudi, an architect, started working on the gargantuan church in 1883. He kept at it for more than 40 years until his death in 1926. Today the work continues, with hopes of completion in 2026. The inside is as impressive as the outside. Give yourself time to explore and take in the many stained glass windows and the colored light they allow to flood the building. The audio guide is informative, and offers the option to skip sections selectively, which some of my family took advantage of. We were also one of the first groups of the morning to ride the elevator up the tower on the Nativity Facade. With the Barcelona city views to be had from atop the church, even most teens won’t balk at a family picture here — the bragging rights are clear. Take as much time as you want to take it all in, than start winding your way down the stairs. The elevator doesn’t carry folks down, but taking in the changing views on the descent is part of the fun. From open to close, La Sagrada Familia is a busy place. Walking up and getting in right away requires superpowers; avoid standing in line by booking tickets in advance. (Don’t forget to include the elevator ride up the Nativity Tower.) If you can get a reservation for the first group of the morning, it is well worth the pain of shaking teens out of bed early. For a change of pace from La Sagrada Familia, a ticket to Gaudi’s modernist La Pedrera building covers entrance into an apartment, the attic and the rooftop. The apartment is decorated as it might have been when the building was first occupied. Models and displays in the attic convey a great deal of history, but it’s worth walking through if for no other reason than to walk under the parabola-shaped arches. The rooftop is the show stealer, with colorful mosaic covered chimneys and Barcelona views that include a straight shot of the Sagrada Familia. Visiting La Pedrera was a game-day decision for my family. We only waited about 10 minutes or so to buy tickets, but when we exited the building, the line had grown substantially. Being organized and booking in advance clearly has benefits. We spotted Praktik Bakery Barcelona walking to La Pedrera, and made a beeline right back to it when we finished our tour. Choose from an assortment of salads, sandwiches, pastries and fresh juices, cafeteria-style, then make your way to an open table. With minimal, if any, waiting time, it’s a casual but tasty choice for hungry kids. More than just open space to run off steam, Gaudi’s Park Guell is a fun outdoor art space with colorful mosaics on everything from benches to walls and fountains. Fabulous city views make it a nice spot to catch your breath and end a busy day. Just like La Sagrada Familia, it’s a good idea to make advance ticket reservations. You could spend days exploring the many marks Gaudi left on Barcelona, but for most teenagers, two or possibly three stops is most likely the maximum, especially if you value family harmony. If you decide to go for three, don’t do the trifecta in one day; bump La Pedrera or Park Guell into Day 2. Get an early-slot ticket and then explore other areas of the city with no time constraints. Everyone who visits Barcelona should spend some time wandering along La Rambla. Less than a mile long, this street is great for people watching and souvenir shopping, and leads to an assortment of other Barcelona’s sights. At one end lies Placa de Catalunya, a square with open space, statues, fountains and pigeons — lots of pigeons. At the other end is a nearly 200-foot monument to Christopher Columbus, as well as the city’s waterfront. Plan on frequent stops on the way between the two. Flower stands provide a sea of color. The Carrefour supermarket is a fun field trip to explore Spanish foods, but don’t stock up on too much food; the famed La Boqueria market isn’t that far ahead. Seafood, fruit, vegetables, spices, meats and rainbows of freshly squeezed juices line row after row of stalls. Wander a bit before you start buying, and be sure to explore deeper than just the stalls near the entrance, which are sometimes more expensive. If you have a sweet tooth, grab a skewer loaded with chocolate-covered strawberries, or a Nutella-and-banana crepe from Creps Barcelona. You can eat on the go, but I recommend grabbing a selection of goodies and finding a table to taste and take it all in. As you get closer to the waterfront and the Columbus Monument, you’ll see an increasing number of street performers dressed in an assortment of historical and fictitious costumes. The walk ends at the sea, kind of. La Rambla del Mar, a pedestrian wooden bridge, extends over the water to a shopping mall in the harbor. If your brood enjoys playing in the sand, nearby Barceloneta Beach is worth packing a swimsuit and towel. Much like La Rambla, the narrow, history-filled streets of Barcelona’s Gothic Quarter lend themselves to wandering and stopping when the mood strikes. Placa Nova is home to the Barcelona Cathedral. Visiting hours and fees vary, but even if your teens aren’t interested in adding another church to the Barcelona mix, at the very least it’s worth walking by to take in the view. From the cathedral, head straight for Santa Caterina Market. (There’s a small playground area just outside for little ones, or teens who feel like showing off their playful side.) Under a colorful Gaudi-esque roof, Santa Caterina Market offers the same color and delicious selection of La Boqueria in a less crowded, more local-dominated setting. Even if it’s not mealtime, it’s hard to leave Santa Caterina without finding something you want to munch on or would love to cook for dinner. Art museums and kids don’t typically mix, but if your teenager has an AP Art History class in their past, present or future, the Picasso Museum highlights works from early in his career. This is the most visited museum in the city, so buying tickets online is a good thing. On Thursday nights the Museum is open until 9:30p, making it a bit easier to fit into already packed schedules or for a family to divide and conquer. Kid-friendly accommodations are plentiful in Barcelona, but the trick is picking one with the exact location and setup that suit your needs. 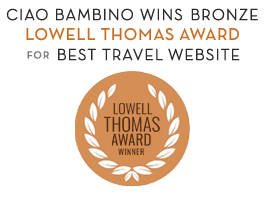 Our expert Ciao Bambino Family Vacation Advisors can help you sift through the options and book the right hotel or apartment, all with one-on-one support. This kind of firsthand insight is invaluable! Editor’s Note: Dana’s stay in Barcelona was hosted by Angla Boutique Apartments. As always, our opinions are our own on Ciao Bambino. Photos by Dana Rebmann. We visited Barcelona about 23 years ago. Nice to see it is much the same. We also explored the summer of 1992 Olympic site. Barcelona was still using some of the venues. I wonder what has become of them. The food you show looks delicious. churches, museums and food markets…are your teens in their 60s? Looks like a lot of fun. I Love Barcelona, great place for any ages, any taste…best time to visit is May-June-September.